Mention Graeme Obree and the first two things that spring to mind are the hour record and washing machine parts. It is his unique approach to doing things that have earned him his reputation as an eccentric genius. A hero to many, mad entertainer to others, and downright annoying to one Chris Boardman. With world records, world championships and two successful hour record attempts under his belt his unorthodox approach has certainly worked. 20 years after his last world record Graeme is attempting another in the only way he knows how. The film Battle Mountain was funded by Kickstarter, which suits Graeme’s low budget approach perfectly. 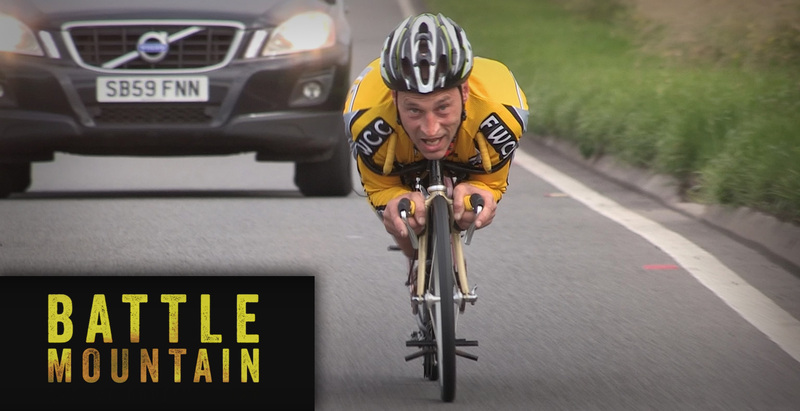 The film follows an attempt on a new world record for human powered vehicles. With the finale set for the International Human Powered World championships taking place in Battle Mountain, Nevada. With the majority of accents being quite broad and Scottish, for those not used to it, it may take a while to get your ear tuned in correctly for every word to be clear. The documentary follows the whole process from concept, build and testing right through to Nevada. With the building and testing phase offering up some comedy gold. Blended nicely into the modern footage are bits of archive footage from key points in his career and lots of back story about his past and personal demons. During filming the truth about Lance Armstrong’s doping scandal comes out and a radio interview offers further insight into cycling’s troubled past and the realities faced by many riders at the time. The “no backing” low budget, no glamor and honesty in the film is what really stood out for me as a cyclist. To the non cyclist this part will perhaps not be noticed, but to a normal everyday cyclist it offers another voice from amongst the marketing we are bombarded with in all our magazines. The voice clearly says that anything is possible, no matter what bike you can afford you can achieve greatness if you want to work hard enough. Graeme makes anything seem possible with his “give it a go” attitude and creative skill set. You will not see a rack of carbon fibre bikes, sport scientists, or nutritionists guiding him through the process. It’s more of an oddly set up brake levers, hacksaw and blow torch approach with a packet of KitKats and some sandwiches thrown in for good measure. The bikes that Graeme creates are more Heath Robinson than solid engineering, but it’s the ideas rather than the craftsmanship that are relevant, and proving his concepts is about as far as he wishes to go with them. So does he prove the concept of the Beastie? You’ll have to watch the film to find out. Hilarious for the first half, edge of the seat nail biter by the end. Open, honest, and all the better for it. It made me want to ride, maybe even look at taking on a world record. Inspiration for cyclists and ideas for engineers, a unique man with unique talents, a very entertaining film. For a list of film screenings visit here. Now available on DVD from here.